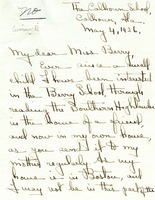 Miss Berry writes a letter to a potential visitor who has interest in the Berry Schools. 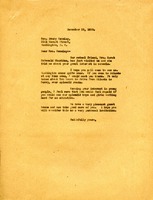 Letter to J.K. Orr from Martha Berry asking for an Atlanta Telephone Directory because they are in great need of one at The Berry Schools. 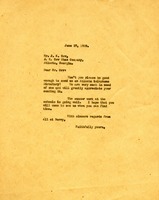 Miss Berry also informs Mrs. Orr that the summer work is going well at the schools and that she hopes that Mrs. Orr will come to visit The Berry Schools whenever is convenient for her. The Berry Schools asks Mrs. Crews about the display table that had not been received from the exhibition in Atlanta. 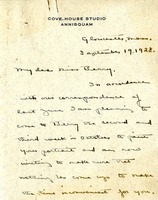 Mr Holt writes Miss Berry to tell her that he and Mrs Frank R Chambers will not reach Atlanta in time to meet with her as scheduled. 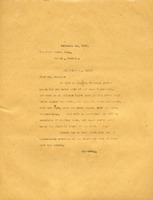 He also provides Miss Berry with a new time and date along with his address in Atlanta. Request of the use of attached photograph for the cover of the next Highlander. If possible would like it in color, but if it can't be well done then using black and white would be better. 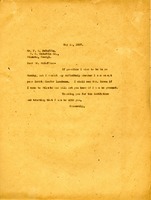 Letter to P.C. 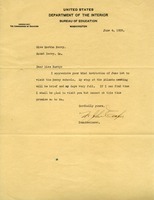 McDuffie from Martha Berry informing him that she hopes to be in for his invitation to luncheon. 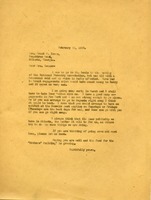 However, she informs him that if she comes to Atlanta she will see Mrs. Inman and will let him know if she is available. 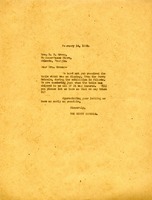 She thanks him for the invitation and trusts that she will be able to join him.